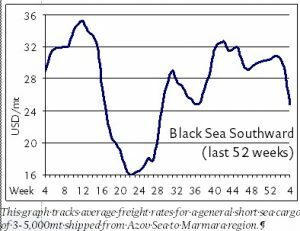 Freights continue to fall rather precipitously in the Azov trades with owners continuously coming up short on the cargo side of the market. Owners say rates have fallen so quickly since their recent peak at the end of 2018 that they are down as much as US$ 9/mt now from that point, roughly a third, consi­dering that Azov/Marmara rates are currently in the low US$ 20s/mt on grain of 5,000mt (46′). A veri­table perfect storm of bearish conditions—extended port delays at Russian ports, the stronger rouble, increased domestic commodity demand (along with lower international demand), rising domestic prices and the fairly mild winter—are conspiring to make this winter a tougher than usual one for shipowners. Kherson/TBS has stabilized at US$ 20-22/mt. Need more short sea news? Consider a subscription to the BMTI SHORT SEA REPORT.